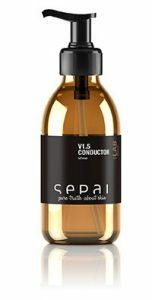 The SEPAI CLEANSING LINE is composed of 100% natural and multifunctional products that are used as preparation and finishing for the technological treatments. The products can be mixed and matched between them in order to find the appropriate texture for each skin type. Make up remover – facial cleanser milk, specially formulated for the delicate eye contour area. Contains Argan oil to nourish and protect the skin, an oil derived mild cleanser, allantoin that favours epitelial regeneration, and glicerin and hibiscus; excelent moisturising and tonifying substances. Multifunctional oil based gel, can be used as make up remover (water proof mascara), cleanser, and as a massage oil. Its gel texture releases encapsulated lipids that are converted into a rich cleansing cream upon contact with water. Formulated with actives that provide pre-moisturization, reinforce the lipid barrier and nourish eye brows and lashes. as cleanser: To perform a cleansing activity water must be added to remove the product from the skin. Delicate cleansing emulsion formulated with actives that cleanse, hydrate and accelerate cellular renewal. Its gentle foam cleans the skin without weakening it. For all skin types or those that prefer a sensation of freshness and a matte finish. Especially formulated for oily or combination skin, gently exfoliating it. The dermoprotective and repairing actives: Green Tea, Gingseng and Ginko Biloba reinforce the self-inmune and skin defence mechanisms. On the same time the osmolitic actives supply the skin with a natural moisturising balance. The anti-microbian and fat-regulating activity from the Burdock extract protects and equilibrates the skin. The mild enzimatic agents, derived from fermentation regenerate the skin surface whilst maintaining the optimum skin PH level. Alcohol-free, balancing and decongesting toner. With rose water, chamomille extract with antiinflamatory anti-septic and anti-oxidant properties, and hammamelis extract that improves microcirculation, producing a flebotonic and anti-cuperose action, besides the anti oxidant properties. ENZYMATIC PEELING: two proteases derived from fruit that weakens the binding of keratinocytes thus facilitating their detachment. CHEMICAL PEELING: Natural polyhydroxy acids that regenerate the skin as well as maintaining cutaneous hydration. MECHANICAL PEELING: Mechanical effect via microparticles of bamboo that gently drags away the superficial impurities. PURIFYING ACTIVE: All this on a white clay base that provides minerals and nutrients for the skin, detoxifying and oxygenating it. effects that works using four mechanisms. This powder based product can be mixed with POLYVALENT, BODY WRAP or CONDUCTOR depending on the desired final texture of the exfoliating product. This powder based product contains 4 exfoliating mechanisms and a thinner bamboo grain and can be mixed with POLYVALENT, NO MORE MAKE UP, WASH or CONDUCTOR depending on the desired final texture of the exfoliating product. Massage candle of rapid fusion due to a perfect combination of shea butter oil, coconut oil, rice oil, jojoba oil, avocado oil and bees wax with the delicate touch of the fragrance of Sepai. Formulated with actives that provide moisturisation and nourishment, reinforce the protective barrier of the skin of the face and body providing softness. Its pleasant aroma is diffused in the room whilst the candle is lit. Wrap – Body wrap/mask to tighten, tone, & firm the skin as a finishing step of a body protocol. Customise it with any extract from the TUNE IT line. Cold effect gel-firming mask x 20 monodoses – Transparent gel facial and breast wrap, rich in alginates from the Sargassum and Durvillaea Antarctica algae and in essential fatty acids, phytosterol and vitamin E from Sea Buckthorn. Vitamin C, antioxidant, glow mask x 20 monodoses – Powerfull combination of 2 kinds of vitamin for short and long term effect: Anti-oxidant, whitening, radiance booster. In practical Monodose format. It can be combined into the active part of the treatment for manual penetration or electroporation for a deep antioxidant and whitenning activiy. Can be added to the final mask for instant glow effect. stressed skin. For all skin types and especially for sensitive or very dry skin. The extracts of the TUNE IT line have been developed with facial quality technological actives. The extracts are pure biotechnological and molecular concentrates designed to counteract specific functions of the skin, of face and body. The extracts have been created to be combined with the bases products. 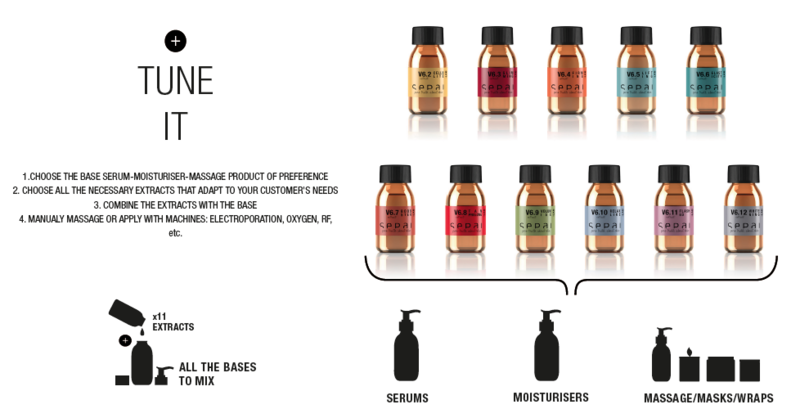 Add 0,4ml of each extract to every 2ml of base product to customise. All extracts are for face & body. Pro-liposome that contains a combination of ingredients to combat cellulitis and prevent its formation. Classic anti-cellulitic extracts are combined with a tripeptide that captures the by-products of lipid peroxidation, improving the effectiveness of the rest of the components in combating cellulitis and preventing the development of the adipocytes. the energy depletion generated by an organism of accelerated metabolism, favouring energy dissipation instead of caloric accumulation. These peptides work accompanied by a high level of carnitine which increases their yield under real energy consumption conditions. the epidermal tissue and creating a natural compacting and firming film. The product contains the v6.1 formula that works on optimising the functions and mechanism of the skin, increasing the production of proteins, cellular longevity, cellular metabolism and environmental defence. Tri-dimensional galactomannan hydrochloride matrix, that releases oligosaccharides that gives an immediate lifting effect and a prolonged effect due to the release and posterior absorption of the oligosaccharides. The product has a dual effect as it increases collagen synthesis. The lifting action effects an immediate mechanical tension on the skin, which translates to a smoothening of the cutaneous surface, giving the skin a firmer appearance. Tetrapetide that inhibits the activity of elastase (elastin degenerating enzyme) thus optimising the quality of the skin’s elastin. It also stimulates the synthesis of collage type I, increasing the elasticity and firmness of the skin. V6.6 ELASTicity has been designed to treat the flaccidity and loss of firmness of mature skin. Vegetable active from Senegal, rich in steroid saponosides (hormone-like activity), flavonoids, leutoline, glucosides and quercitin; substances with vasculoprotective and Venotonic properties that work on the skin in a way similar to the effect of steroids. Peptide stimulator of melanin synthesis; increases the quantity of melanin in human melanocytes in the absence of UV radiation and favours its correct distribution at the epidermal level. Loss of volume will no longer be a problem with this peptide extract that favours the accumulation and maturation of adipose tissue combined with high concentrations of hyaluronic acid that provides volume to the area treated. For all skin types, to redensify and redefine volume in the face (cheeks, lips, chin shadows) and the body (hands, bust, buttocks). Extract based on the combination of a powerful peptide that inhibits acetylcholine, thus inhibiting muscle cell contraction; a powerful natural component: Spilanthol, that induces myorelaxation and lastly, a modern peptide, Tyrosil-Arginine, with a neurocosmetic action: increases the production of opiate neuropeptides in the keratinocytes that modulate hypersensitivity caused by extreme temperatures, itching and rubbing. Flash effect extract. With actives that provide an immediate tensor and illumination effect, with a light texture ideal for all skin types. Whitening and blemish reducing extract. This cocktail of actives works on the external and internal factors that cause skin coloration. Unifies tone and lightens blemishes. Gel serum based on hyaluronic acid and organic silicon that facilitates the absorption and electroporation of other aqueous actives. Contains electrons to facilitate the use of appliances with magnetics charges. (Electroporation, polarities, passive gymnastic). The serum may be used to moisturize oily and acneic skin. Concentrated gel-serum formulated with agents that target on the 5 causes of skin ageing. Formulated with specific actives that provide the skin with an extra load of energy and protection, reinforces photo protection and reduces the synthesis of pro-inflammatory cytokines. Combats aging processes caused by environmental factors: free radicals ROS, RNS, RCS, pollution, UV radiation, smoke, glycation. Dual-phase serum from ingredients that target on the 5 causes of skin ageing, stimulate the production of: HSP70, collagen, elastin, fibronectin, fibroblasts, laminin, keratin and integrin B1. It helps counteracting the processes of metabolic aging. Multifunctional cream in a very rich texture for face, neck and neckline, designed to prevent, correct and attenuate all signs of skin aging RMI5. Works optimizing the skin performance. SPF 15. Triple action eye cream in both light (V4.0) and very rich texture (V4.1+) formulated to prevent, correct and attenuate all signs of aging in the eye area. Works on bags, dark circles and wrinkles. 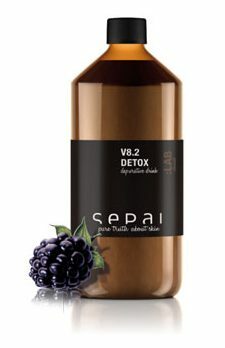 and free radicals, stimulating the production of collagen and elastin. Rich body milk that provides extra nutrition with an exceptional silky texture based on natural oils. With a glow effect that lightens and smoothes the skin. No oil derivatives allergens or sensitising substances. Protects the hydrolipidic layer while deeply nourishing. process of the organism. Sweetened with sucralose, the only natural sweetener extracted from sugar, with zero calories and 100% safe.